President Donald Trump has predicted a "tremendous increase" in UK-US trade, after talks with Theresa May. He also said the US and UK were "joined at the hip" on military matters, while Mrs May said they stood "shoulder to shoulder" in facing shared threats. In a series of warm exchanges in Davos, Switzerland, President Trump also told the UK PM: "We love your country." He also rejected "false rumours" of differences, saying that the two leaders "like each other a lot". And Downing Street said later that they had asked officials to work on "finalising the details of a visit by the president to the UK later this year". It was their first meeting since clashing over the US president's retweets of far-right videos in November. And earlier this month Mr Trump cancelled a visit to the UK, criticising the location of the new US embassy in London. But after their meeting, Mr Trump told Mrs May at their news conference: "I have great respect for everything you are doing, we love your country, I think it's really great." The two leaders met in Davos, at the World Economic Forum, with post-Brexit trade relations between the two countries high on the agenda. Mr Trump said: "One thing that will be taking place over a number of years will be trade. Trade is going to increase many times. "I look forward to that... the discussions... that will be taking place are going to lead to tremendous increases in trade between our two countries which is great for both in terms of jobs. We look forward to that and we are starting that process, pretty much as we speak." He added the US would be "there to fight for you - you know that" and the two were "joined at the hip when it comes to the military". Mrs May replied that the "really special relationship" between the UK and US continued and they stood "shoulder to shoulder because we are facing the same challenges across the world". "Alongside that working for a good trade relationship for the future which will be for both our benefits, so the UK and the US both do well out of this - and it's been great to see you today." 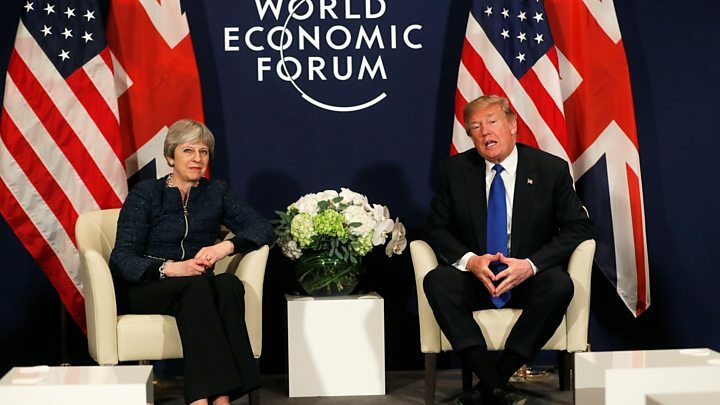 In response to reporters' questions, both leaders said they would "talk about" his state visit to the UK - offered by Mrs May when she visited him in Washington shortly after he became US president. No date has been set. Downing Street later confirmed that the visit officials were discussing this year would be a working, not a state, visit. But BBC North America editor Jon Sopel said the British would be pleased with the press call. The mood music had been good and the Americans were talking positively about a trade deal. A Downing Street spokesman said the two leaders had also discussed the Bombardier trade dispute and that Mrs May had "reiterated" the importance of the firm to Northern Ireland, Iran, Syria and Brexit negotiations. The UK prime minister had earlier addressed the World Economic Forum about the need to put more pressure on tech giants to deal with extremist content and tackle child abuse and modern slavery on social networks. She said shareholders should use their influence to "ensure these issues are taken seriously". "No-one wants to be known as the terrorist platform, or the first-choice app for paedophiles," she said. She said some progress had been made but more must be done "so that ultimately this content is removed automatically". She acknowledged people's concerns about the impact of technology on jobs - pointing to Uber as an example of a company that had "got things wrong along the way". The ride-hailing firm should not be shut down but should address concerns about safety and workers' rights and enforce standards "that can make this technology work for customers and employees alike", she said. Mrs May said that employment law must keep pace with the way technology is changing jobs and while it must protect the "flexibility" companies valued, it must not be "a one way street deal that can become exploitative." The UK is in the process of leaving the European Union - the day set for Brexit is 29 March, 2019, so is expected to negotiate its own trade deals in future, rather than being part of the deals drawn up on behalf of all EU member states.